For those that don’t know; Tech Deck skateboards are finger sized toy skateboards. They are very authentic with moving parts and actual graphics from the skate companies and Pros. They have tech deck skateboard, tech deck long boards and tech deck competition boards with wood decks. 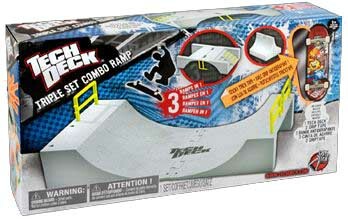 There are tech deck ramps to play on too. As a child I always like miniature toys. I would play with Micro Machines instead of regular toy cars. I like that size better. It was more fun for me. I didn’t have tech decks when I was young. I would have loved them.As an adult I still think its fine to play with a tech deck to keep me busy. It’s fun to visualize your skateboarding withe the miniature. You can do loads of trick that you wouldn’t be able to do in real life. It keeps you from getting bored when the weather is bad and you can’t skate. I don’t think it’s a big deal to “play” as an adult.I say: chill out and enjoy yourself. When I was in highschool to battle boredom in class I would carve my eraser into the shape of a skateboard.Again in college I would always have my tech deck skateboard in hand during a boring lecture. On the computer,While watching T.V.,Pretty much any where I have to sit I would have a tech deck in hand.It helps me stay focused believe it or not. If I can fidget and get rid of extra energy while trying to get things done I am way better off. There are some who can do ollies and other tricks with their tech deck. I was never able to get them to work that way. I came up with a 3 finger technique the works just fine for me. I hold my middle finger under the board and use the other two fingers to control it. Works fine for me. I make things to skate with my tech deck out of pretty much anything I can find. Usually books or DVD cases make up the ledges, manny pads and flat banks need to keep occupied. There are sets and ramps that you can buy and some are really pretty cool. I wish I had the bowl or quarter pipe so that I could put the kitchen stuff away. There are a few sizes that they have made of the years. This was my collection at one time.I lost the smallest one. It was just too small to keep track of. The 6’ one is good for rolling on your back but a little too big to play with. The best is the 3” version. It fits in your hand the best. Good for using only one hand. It makes the least noise and can fit in you back pack no problem. The grip tape can be pretty coarse at first. It may even be enough to make your fingers sore after a few minutes of use. I have worked in a few different boards over the years. The one I have from college have no graphic left on it at all and the grip tape is wearing away at on the top too. Yup, I studied hard. 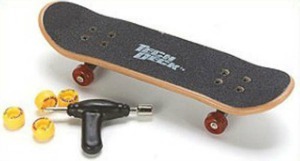 Some tech deck kits come with tools. This is useful because of the working parts are super small. It is pretty cool that the bolts and bushings work like the real thing but only smaller. The drawback is that when the nuts get loose or fall off it is pretty tough to get them back on or even find them on the floor. I save a bag with extra parts in it and a small tool from one of the kits. I use it to keep things tight. You might be thinking why does an adult play with toys. Is that a little weird? Sure its might be a little odd. I don’t care what your age is. Keeping life playful is key. I use my tech deck and it helps me concentrate and enjoy myself throughout the day. I wouldn’t change that for the world.